Thanks for looking at our Precision Pet Precision Zig Zag Crate Mat Gray 3000 31x21in! 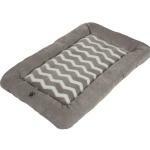 The Snoozzy Hip as a Zig Zag Low Bumper Mat softens crates, carriers, homes, or anywhere your pet likes to spend time relaxing. Center of bed is made with luxurious warm and cozy long terry plush fabric to help your pet feel safe and secure.